This is a fun entree or party food. 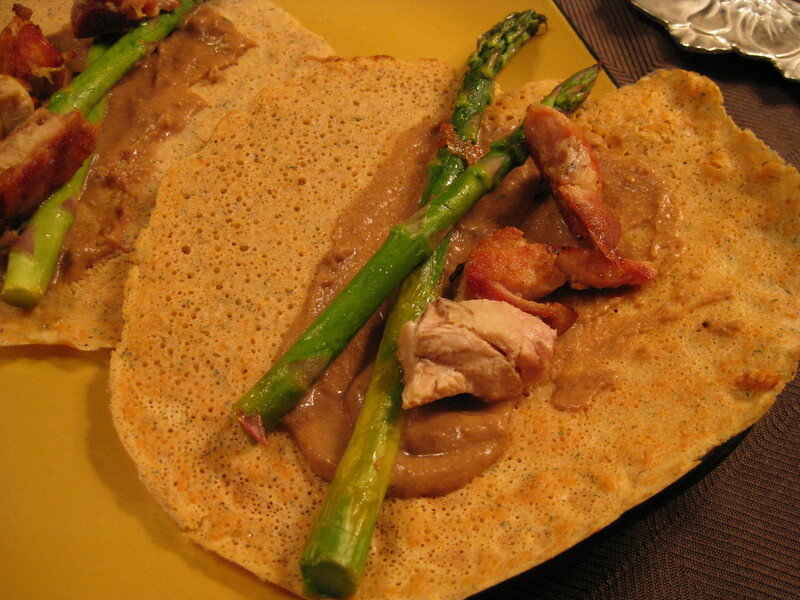 The crepes are dryer and more sturdy than french crepes and can stand up to being a finger food. Mix these in a blender. Scrape the sides of the blender pitcher and blend again to remove lumps and fully incorporate all the flour. Heat crepe pan or skillet to medium high. Oil the skillet with a high temperature friendly oil like sesame, grape seed, or coconut oil. Pour about 1/3 C batter onto pan and rotate quickly to make a thin layer of batter over crepe pan. Flip when the crepe looks dry. If your crepes are thin enough, you do not need to cook them on both sides. In a food processor, blend the lentils with the curry seasoning. Green curry is a blend of chili powder, green chili, ginger, garlic, cumin, lemongrass, and salt. You can make your own or buy a mix. There are many good green curry blends made from organic and fair trade spices. 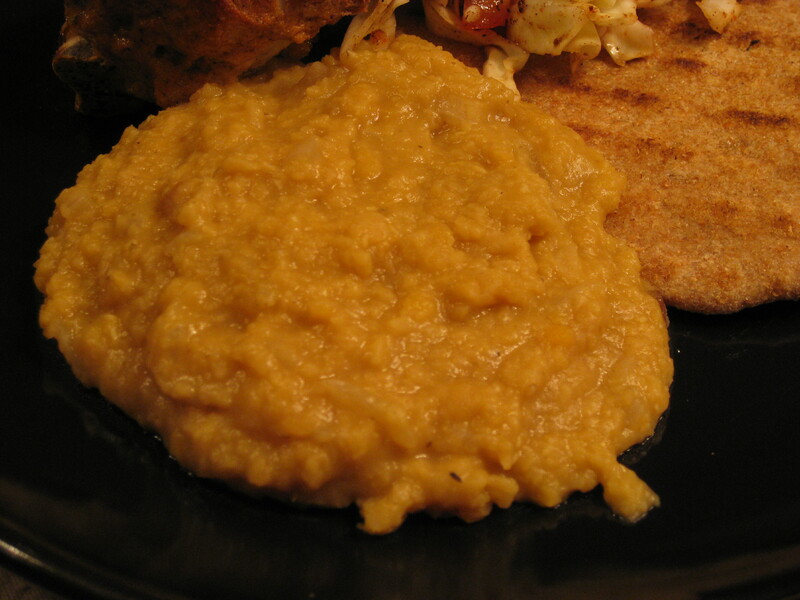 Heat seasoned lentil mash over medium heat, stirring frequently. When it is heated through, remove from heat and stir in spinach. The spinach will wilt into the lentil mash. It may be easier to add the spinach in batches rather than all at once. I really cheated on this one. I just blended 1/3 C plain yogurt with a few squirts sriracha. You can use chili powder and salt to season your yogurt if you ran out of sriracha. But you should probably just go get more sriracha. 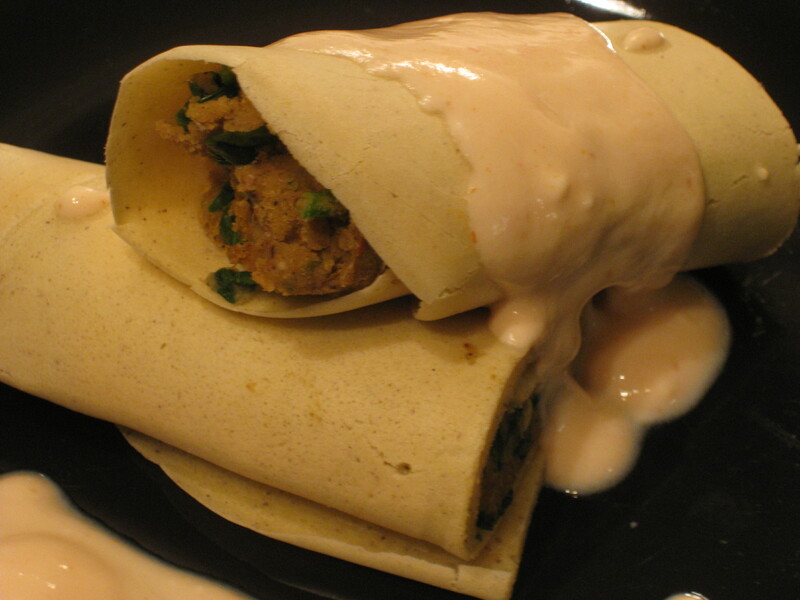 Fill crepes with 3 TB lentil and spinach curry mix. Roll tight. Either cut into finger-food length and serve with yogurt on the side as a dipping sauce OR leave the crepes long and drizzle yogurt sauce over them for an entree presentation. This is great to serve as a side dish to any Indian style main course. It’s also a great way to prepare lentils for kids, just adjust the chili powder to their taste. For some kids, that may be doubling the chili powder! Add onion, fats, salt, and seasonings to a small stock pot. Brown over high, stirring constantly until onion begins to caramelize. Stir in lentils. Coat in spiced oil by stirring vigorously. Stir in water. Scrape bottom of pan with wooden spoon to release all the browned flavors from the pan. Reduce heat to medium low, cover, and simmer for 20 minutes or until lentils are soft. Stir occasionally. Split lentils will cook quickly and break apart. The texture is very smooth and creamy without adding dairy. 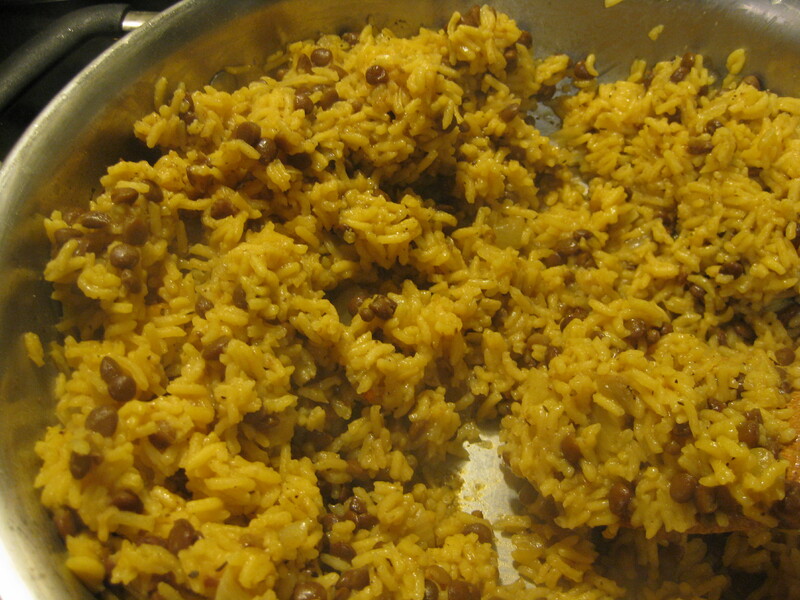 Serve with naan bread or over rice. This is an easy side dish that matches any main. This is a huge recipe that many of you will want to divide in half for regular sized families. If you have teenagers, then this sized batch is for you. Saute onion in oil for 5 minutes until onion is translucent and begins to caramelize. Add rice. Stir to coat evenly. Add broth and seasonings. Cover and reduce heat to simmer. Simmer for 25 minutes or until all the liquid is absorbed. Stir in lentils. Cover and let rest with heat off for 5 minutes. A great side dish to fish, chicken, or grilled veggies.